So, you’ve made the right choice by installing a commercial geothermal heat pump and have already witnessed the stunning savings in energy. Is there anything you can do to keep it running at maximum efficiency while prolonging its life? You bet! Just like all HVAC equipment, some routine, minor maintenance will both retain the natural efficiency as well as prevent damage and repair costs. Here are 4 things that should be done periodically for ideal operation. Prior to running, a chemical flush of the pipes is essential. Over time, debris accumulates in established systems and eventually causes internal damage. Open-loop systems require periodic flushing, although all types of systems will benefit from doing it occasionally. Air intrusion into your system is a serious matter. It’s designed to run at a precisely calculated pressure which trapped air will alter, reducing efficiency, causing corrosion and, if left unfixed, system failure. Purging the air during annual maintenance will prevent it from gathering in significant amounts. Commercial geothermal systems often have multiple zones and sections, each with its own flow rate. A qualified technician can run tests to ensure that all of them are set correctly with the most advantageous flow. Ideal system pressure is key to keeping your geothermal heat pump running at peak efficiency. The pressure changes as the piping expands and contracts with temperature variation, so a qualified technician should be consulted for rigorous pressure testing and maintenance. Due to the advanced technology of commercial geothermal systems, you should have it serviced by experienced technicians. In fact, annual maintenance has been shown to pay for itself in energy savings and repair costs. 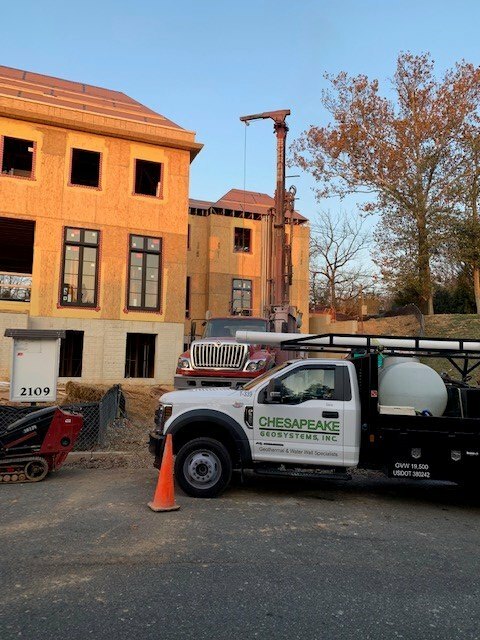 Chesapeake Geosystems has IGSHPA-certified technicians who can keep your system running smoothly and protect it from damaging conditions, regardless of who installed it. As the region’s largest geothermal specialists, we’re licensed in 15 states and have been installing, inspecting and maintaining systems for over 30 years with unmatched experience and customer satisfaction. Please call us today at 410-489-1712 or send an email to Chesapeake Geosystems; we’ll be happy to answer any questions you have.